Who doesn’t love a happy accident? After Jason purchased the wrong cut of ribs for a small dinner party, (he is the baker in the family), we were left with 3 pounds of thin beef short ribs that could only be cooked one way – on the grill! The trouble we had with that is that we didn’t have a grill and we don’t have a backyard for grilling. Because our kitchen doesn’t have a powerful exhaust fan for ventilating lots of smoke, no grilling indoors either. Our only option was to get a grill, pack our wagon, and walk a few short blocks to Golden Gate Park. Fresh off our recent camping trip, we were feeling confident about the whole outdoor cooking thing. Korean style beef short ribs (kalbi) are perfect for summertime outdoor grilling. The thin cross cut of the rack (a “flanked” cut) makes the rich, tender, fatty meat perfect for bold marinades and hot charcoal. They cook quickly, so they have to be watched. A minute too long on a hot grill can mean the difference between perfect and charred. This was our first go at Korean barbecue. The marinade is a mix of sweet and salty with lots of garlic and ginger and toasted sesame oil. Like several recipes we found, this one called for grating an Asian pear into the marinade. It adds sweetness, and the enzymes in the fruit help to tenderize the meat (the ribs hardly need it, but who are we to argue with the recipe). Nearly all the ingredients for this marinade are available in major grocery chains. We’ve come to love the marinade so much that we’ve used in multiple times since with Coho Salmon. Whatever protein you use, always serve with good white rice and kimchi. In a bowl, whisk together all the marinade ingredients. Transfer beef ribs to a gallon sized sealable freezer bag, you may need 2 (or a container large enough to hold the ribs and marinade). Add marinade, press out excess air from bags, and seal. Turn bag over several times to ensure beef is evenly coated. Refrigerate for at least 4 hours but preferably overnight. Steps away from amazing food. 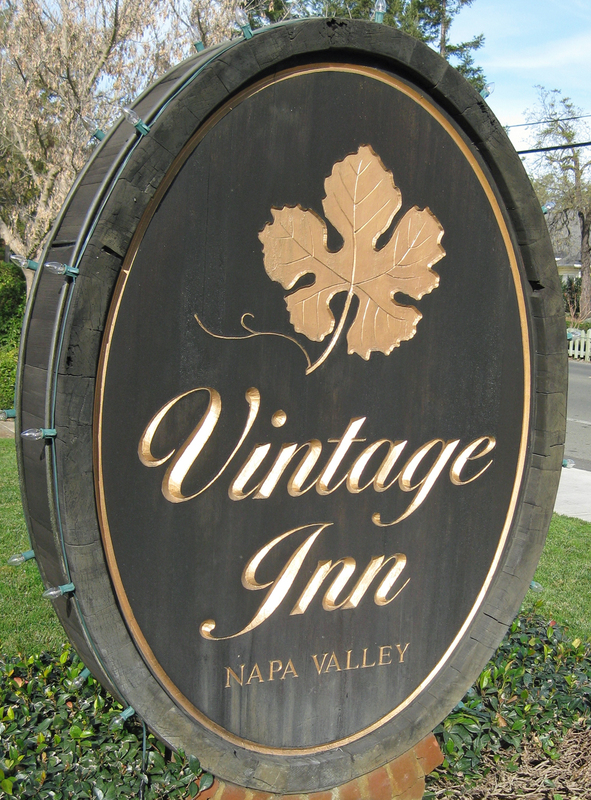 We woke up Saturday morning to Vintage Inn’s “Champagne Brunch” spread. After all we’d eaten Friday, we surprised ourselves by diving headlong into the omelet station. The jog we planned for later in the day became imperative if we were going to enjoy the rest of the day’s culinary indulgences. Because after all, we do live, breathe and write about food. After a four-plus mile run through Yountville and a local vineyard, we still weren’t hungry for a typical lunch. We knew we’d be famished if we didn’t get a little something into our bellies before our Bouchon reservations at 7:45, so we tucked into Philippe Jeanty’s charming Bistro Jeanty for a cocktail and a bar bite to take the edge off. Seated at the bar, we sipped our drinks and noshed on a hearty serving of Terrine de Lapin (rabbit pate) accompanied by céleri rémoulade (celery root and apple salad), cornichons and a tasty housemade yellow pepper mustard dressing. The thick slice of terrine was well balanced with the lean, meaty rabbit and pork fat. The pepper mustard was an elegant accompaniment to the rich charcuterie. Rabbit terrine on the left, ratatouille on the right. Terrine would have done the job of curbing hunger, but we’re on holiday and the ratatouille on the menu was irresistible. Served in a small casserole and bubbling hot, the ratatouille was beautiful with its thin neat scalloped layers of tomato and zucchini (very similar in presentation to the ratatouille dish in the Pixar film of the same name) concealing a savory, saucy vegetable mélange. We sopped up the juices with slices of crusty baguette, finished our drinks and headed back to our room to rest up for the evening’s main event. 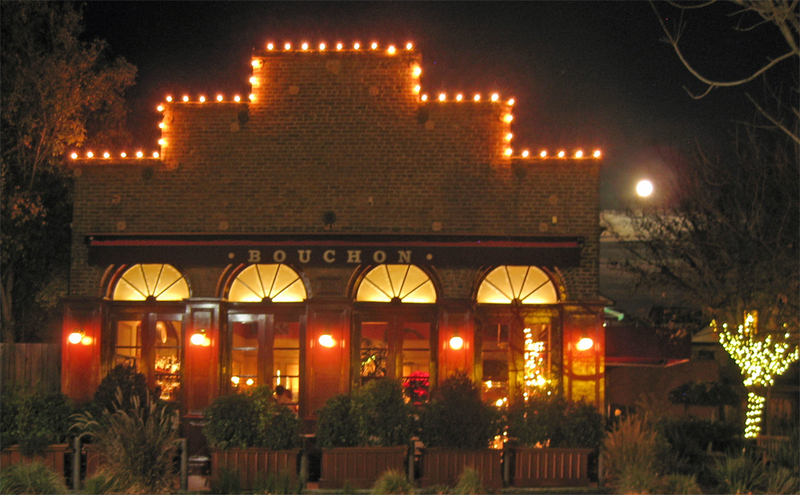 Bouchon at night with the full moon on the right. Hey, that rhymes. Day two in Yountville and we’re seated once again at a Thomas Keller restaurant. This is our second meal at Bouchon (the first was a brunch back in 2007) and this time it is to celebrate the nineteenth anniversary of the night we met. Still working off the rabbit, Jason recommended we take it easy and share a salad, an entrée, and a side of French fries dusted with truffles so we could save some room for dessert. There are times when the lighting in restaurants needs a little help. We ignored the evening specials and ordered a Salade de Cresson et d’Endives au Roquefort, Pommes et Noix (cress and endive salad with bleu cheese, apple and walnut). We love crisp, bitter leaves of endive and these were nicely dressed with a walnut vinaigrette that added a warm, nutty richness to the salad. Peppery watercress and small cubes of fuji apple gave the dish a bright tang and the bites of bleu cheese added a bit of richness. The rather tall pile of a salad was hearty and filling and once our plates were empty, we knew we’d made the right decision about sharing an entrée. Using the iPhone flashlight app and Photoshop, this photo came out a little better. Always suckers for short ribs, we ordered the Boeuf Bourguignon. Still haunted by the memory of the short rib hash we enjoyed back in ’07, Steve couldn’t resist the braised beef dish that so many consider quintessential French bistro fare. 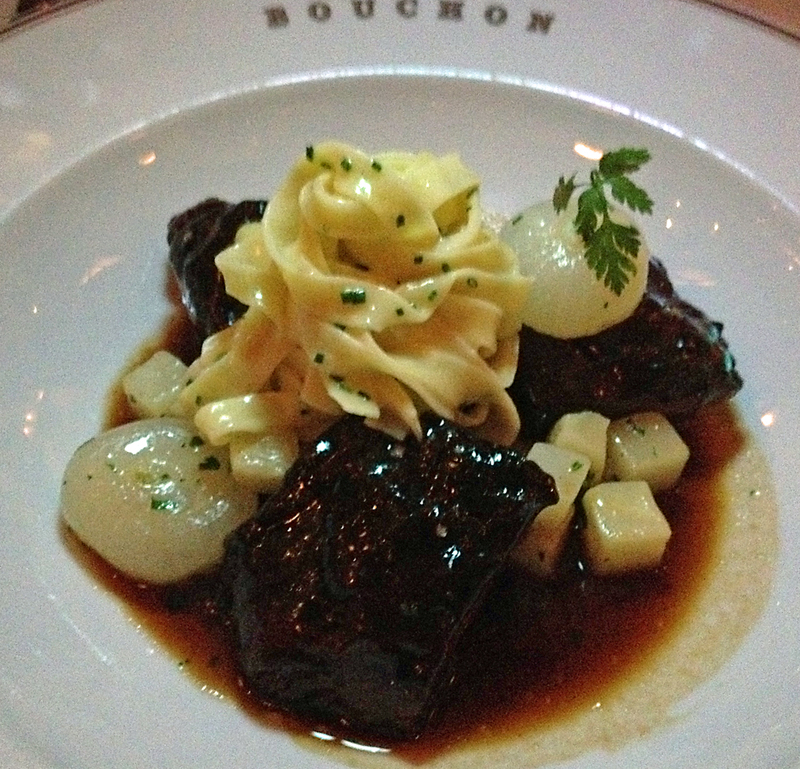 Of course, any foodie will tell you that Boeuf Bourguignon is Julia’s signature dish. Served with a generous slice of thick porkbelly (bacon), cipollini onions, root vegetables, butter noodles and red wine sauce, the dish was an ideal antidote to the chill of the evening. The braised beef was tender but not mushy and the red wine jus gave each piece a beautiful lacquer finish. Tender egg noodles sopped up the sauce and the bacon scented the dish with sweet smoke. We loved this dish, but the root vegetables need some work. We found the cubed veggies to be a little off, tasting of cardboard. But because they weren’t well integrated, we were able to push them aside without losing anything else in the dish. The stand out star of the evening was the basket of truffle dusted French fries. Mind you, almost anything with truffles will shoot your taste buds into orbit, but these fries were crispy on the outside and light and fluffy on the inside, just as they should be. The photo we took was too blurred to publish, but just imagine a cone filled with these beauties. The best photo of the night, but sadly the most disappointing dish. After finishing our half-carafe of the house red wine ($25 for 500 ml = bargain), we sipped coffee and attempted a slice of Tarte au Citron (lemon tart). 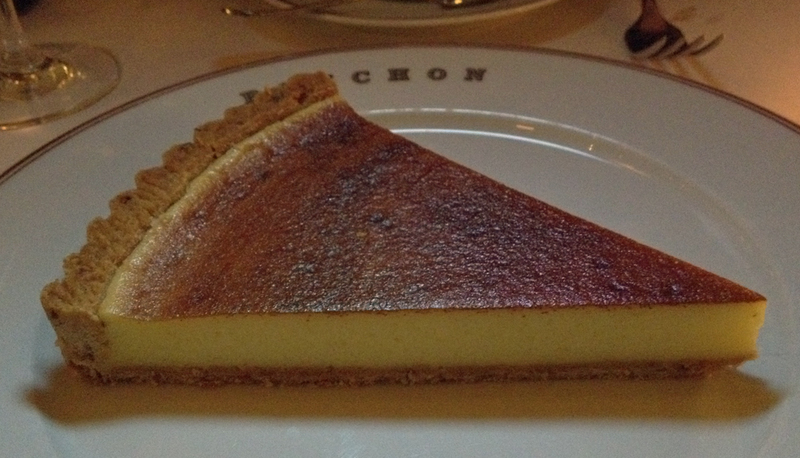 The tart slice was beyond generous; double the size one would expect from a fine restaurant of Bouchon’s caliber. Alas, while the tangy lemon sabayon was refreshing, we didn’t love the pine nut tart pastry. We love pine nuts and we eat them regularly, but they are delicate and tend to oxidize quickly. We don’t know if the crust failed because of the nuts, but our server admitted that this desert was a love-it-or-hate-it gamble as some customers found the shell to exhibit odd, off-putting flavors, while others believe it to be wonderful. He graciously removed it from the table, and our tab, and replaced it with a lovely bag of the bakery’s signature Chocolate Bouchons (dense brownies), which we took to go. 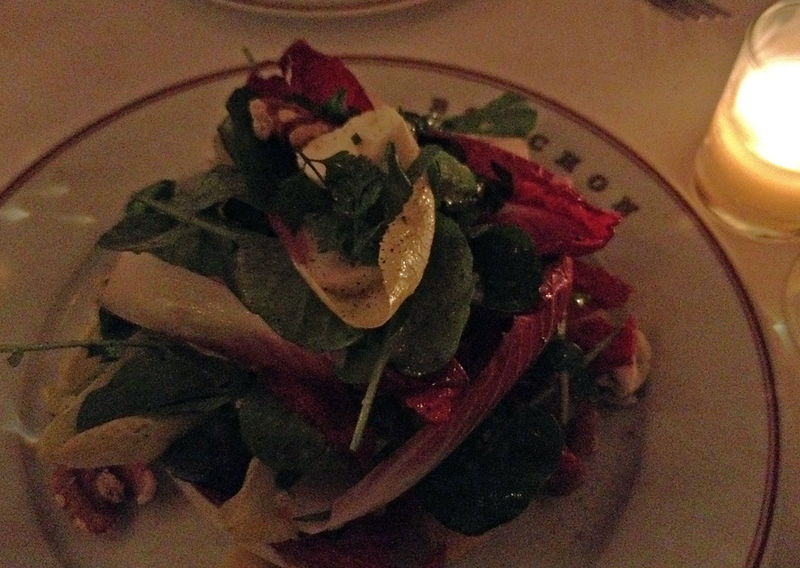 Even with the minor meal infractions at Bouchon, we left very pleased with the experience, service and the food, which is exactly why we dine out.